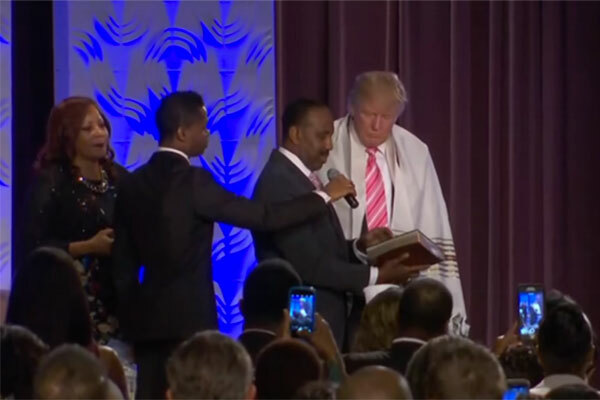 (JTA) — Donald Trump was gifted a traditional Jewish prayer shawl by a pastor during a visit to a black church in Detroit. 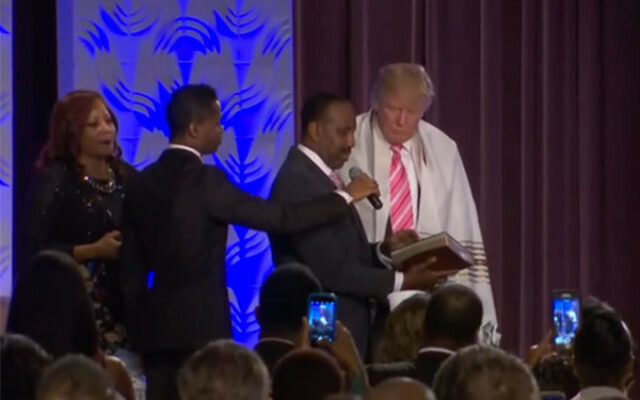 Bishop Wayne Jackson of the Great Faith Ministries in Detroit draped the tallit around the Republican presidential nominee’s shoulders Saturday after Trump addressed the congregation. The pastor also presented Trump with two Jewish Heritage Study Bibles, one for the candidate and one for his wife, Melania Trump. Ivanka Trump, Donald Trump’s daughter, is a convert to Orthodox Judaism. Jews traditionally wear a tallit for prayer, following a commandment in the book of Deuteronomy. Some Christian churches have adopted the practice, however. Trump visited the church in an effort to reach out to the African-American community, which polls show overwhelming support his opponent, the Democratic presidential nominee, Hillary Clinton. “I’m here today to learn so that we can together remedy injustice in any form, and so that we can also remedy economics so that the African-American community can benefit economically through jobs and income and so many other different ways,” Trump said in his address to the congregation. Many took to social media to criticize and mock the incident.